Buses constitute the only form of public transport within the City of Tartu. There are 25 bus routes in the city, with a total length of 491.1 km. Since 2011, Tartu’s public transport has been run by the transport company AS Sebe. All buses servicing city routes have low floors and follow a single design. In 2011, the city introduced 5 buses that run on compressed gas and which can also use biogas for fuel. In 2013, information signboards were installed at 44 bus stops, providing real-time information on the arrival of buses. From autumn 2015, a new electronic ticket system went live, with passengers using a contact-free smart card or sticker to register their journeys using on-board validators at the beginning of each journey. There are two free of charge bus service takes shoppers directly to retail shopping centres. One from Kaubamaja Shopping Centre to Lõunakeskus Shopping Centre and one that departs near to Kvartal taking passengers to the Prisma supermarket, located at Jõe Shopping Centre. You can use the Tartu Bus Schedule smartphone application. The 24-hour information phone and helpline when calling from the City of Tartu and Tartu County is 1789 (to obtain ticket information, press key 2). Should you have any problems related to the bus card, you may also call +372 611 8000 (Ridango) or write to the e-mail address info@pilet.ee. 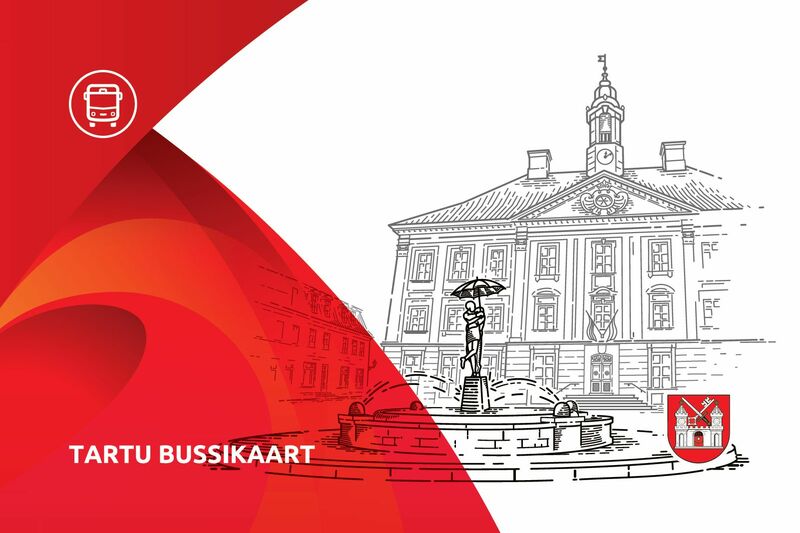 Proposals for bus traffic/travel improvement can be submitted to the City Government by sending an e-mail to buss@raad.tartu.ee. The discount only applies to recipients of the old-age pension. It does not extend to those receiving a pension for incapacity from work who must purchase full-priced tickets. The discount does not extend to individuals with moderate disabilities. If a passenger has not bought a specific ticket and there is enough money on the smart card account, the new system will charge the passenger the cheapest price, up to the price of a full day ticket. For example: if a passenger makes several trips within one hour, they will pay 83 cents for the first trip, 13 cents for the second trip and every trip thereafter, within the hour, will be free. The system calculates day tickets in a similar way – passengers can take an unlimited number of trips for €2.11. How can I use the bus card? Why should I personalise my bus card? 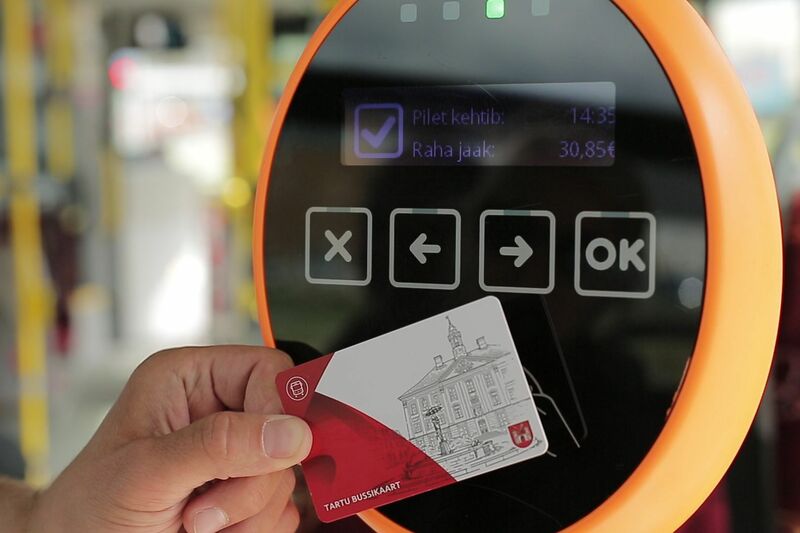 From 1st September 2015, the City of Tartu started using a modern ticketing system which is already in use in many places throughout Estonia and Europe. A contactless plastic chip card, or a sticker, which must be swiped at on-board validators upon entering a city bus, has been introduced. Use of the bus card is compulsory for all passengers, except those travelling for free under the provisions of the Public Transportation Act. Pensioners over the age of 65 and other passengers with the right to free travel from the City of Tartu, must also register their journey at the validator. Students can use their new student cards as bus cards. Tartu bus cards can also be used in Tartu County, Tallinn, Jõgeva County, Narva, Rakvere, Sillamäe, Lääne-Viru County, Hiiumaa, Saaremaa, Valga County, Põlva County and on Go Bus intercity lines. Bus cards of Tallinn, Go Bus and Ridango can be used in Tartu and vice versa. New bus cards and stickers can be purchased at R-Kiosk, shopping centres and other stores. A list of retailers is available at https://tartu.pilet.ee/pages/retailers. Cards cost €2. Passengers aged 65+ and other passengers with the right to free travel from the City of Tartu can receive their first bus card for free, upon presentation of a valid identity document. Cards were collected from 20th August until 30th September from Tartu Kaubamaja, 2nd Floor (in front of the bookshop, open during shopping centre business hours), and thereafter from the City Hall Information Centre. The ticketing system uses credit card-sized bus cards and similarly sized stickers, which can be attached to a wallet, telephone, or any other handy item. Both the card and the sticker function as bus cards and passengers can decide which one is most convenient for them. 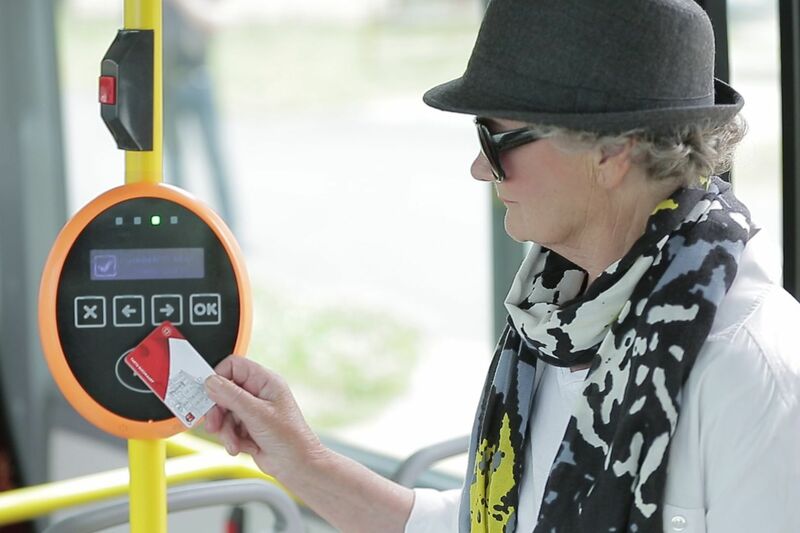 Board the bus and hold your card up to one of the on-board validators, until you hear a beep. Both registered and non-registered cards can be used, but only registered cards (a card linked to one particular person) can receive a travel concession. Using a registered card also ensures that your credit is preserved in the event of you losing your card. Registered cards are valid only with valid identification. Bus cards can be registered at sales points and online at https://tartu.pilet.ee/buy. You can load money onto your card and buy tickets at sales points, online at https://tartu.pilet.ee/buy and via mobile phone. Dial: 1322*ticket code*card number*(star). An additional service fee of 0.32 EUR, and, if requested, a reminder fee of 0.51 EUR, will be added to the ticket price. A short reminder will be sent via SMS to remind you that your ticket is about to expire. You can check the account balance on your card at the on-board validators. Swipe the card once to register your trip and swipe it again to bring up your account balance. You can also check your balance at sales points and online at https://tartu.pilet.ee. When boarding a bus, hold your card or sticker up to the validator until you hear a beep. If your card has credit or a valid ticket, but you have not validated your trip, you may be fined. You can check your account balance by swiping your card a second time. Up to five people can travel together with single tickets using one card. First, register your card at the validator, then choose the number of tickets to be purchased using the arrows on the validator, then confirm your purchase by pressing OK and swiping your card again. Additional travellers can buy full-priced tickets only. 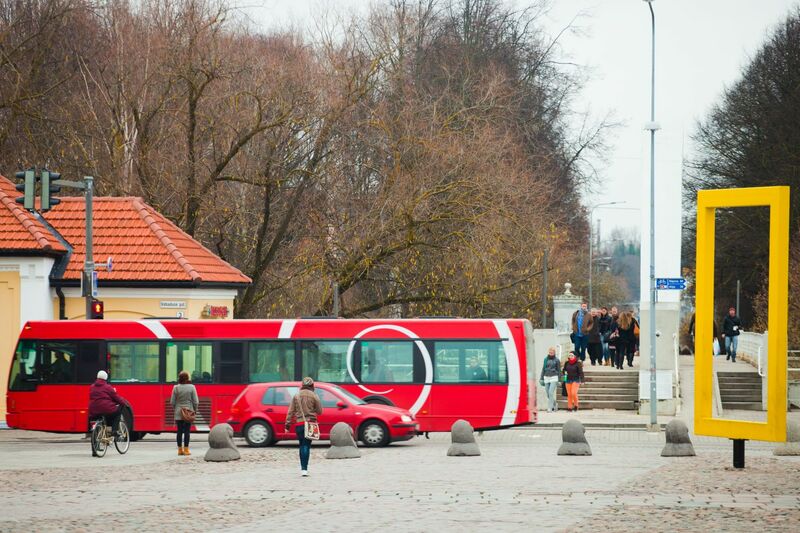 Foreign pupils and students can use Tartu bus cards on the same basis and price list as people living outside of Tartu. Citizens of the European Union who take up residence in Estonia must register with local authorities, after which they will be given the right to live in the country and to apply for an ID card that reads ‘Citizen of the European Union’. In both cases, said persons are registered in the Estonian Population Register and assigned personal identity codes which can be used to personalise their bus card and apply for a discounted ticket. The discounted rates only apply upon presentation of an identity document issued in Estonia. A personalised bus card and an identity document (if the pupil lives in Estonia according to the Estonian Population Register and is registered with the Estonian Education Information System). A student ID issued in Estonia that is compliant with RFID technology (if the pupil lives in Estonia according to the Estonian Population Register and is registered with the Estonian Education Information System). A personalised bus card and an identity document to purchase an e-ticket (if the student lives in Estonia according to the Estonian Population Register and is registered with the Estonian Education Information System). A student ID or any card of equal status (ISIC card or ISIC MasterCard). ISIC cards must be personalised on the Tartu bus card website. Starting on 1 October 2018, a free express bus will begin operating between Tartu Airport and the city, bringing travellers to the airport early in the morning and taking them back to the city from their arriving flight. The start and end point of the line is by the Annelinna Keskus (Kalda tee 43). *The departure time of the bus from the airport in the direction of Tartu may change slightly, since the bus departs the airport once all passengers have exited the terminal. 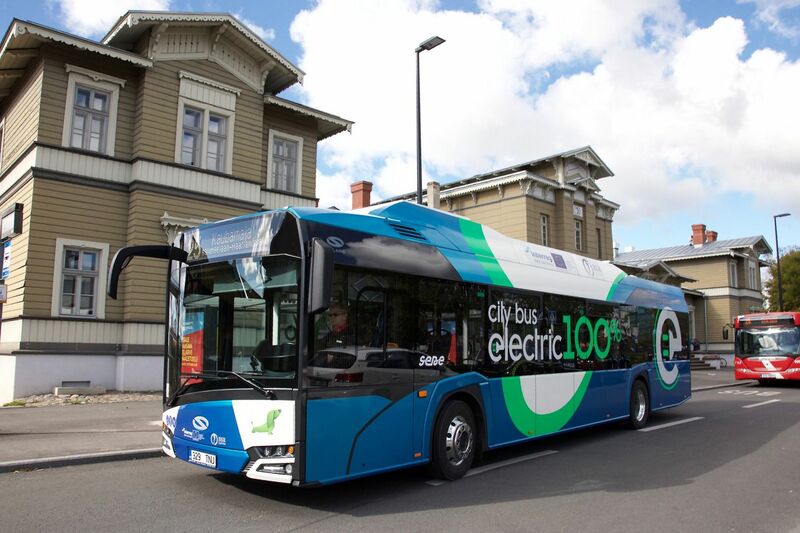 The Airport Shuttle is operated by AS Sebe, with whom a contract for services was concluded for the electric bus line which began operating between the Tartu Bus Station and the Tartu Railway Station in September of this year.